Following reports that Kiev’s military has launched a massive artillery attack on Donetsk, hitting residential areas, according to the DPR, Russia’s FM has called the OSCE chairman urging him to influence Kiev into immediately halting ceasefire breaches. 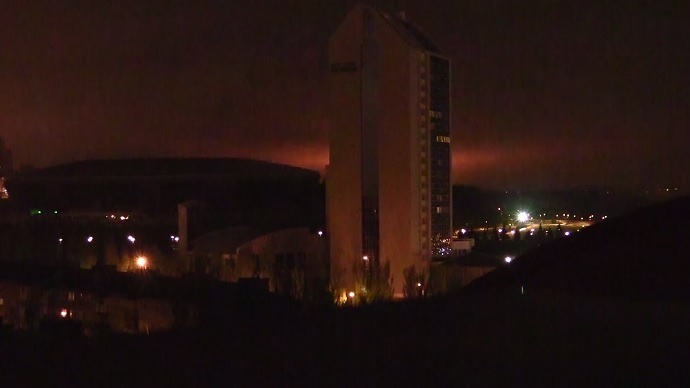 The first reports of explosions and ongoing shelling in Donetsk started to emerge at around 22:30pm local time. Witnesses have recorded numerous videos showing bright flashes in the night sky and loud shell explosions, allegedly in the northern part of Donetsk. “Ukrainian security forces are shelling the Kiev district [adjacent to the Donetsk airport], tanks are firing at the Putilov bridge [area],” a representative of the self-proclaimed DPR’s Ministry of Defense told Interfax. “[Ukrainian military are] shelling Donetsk airport with 120-millimeter mortars,” the spokesman added, claiming that residential areas are also being hit. Shelling has also been reported near the villages of Peski and Spartak, north of Donetsk. At least three civilians and six members of self-defense forces have been injured in the shelling, the Donetsk news agency wrote. “According to preliminary information, two men in Yasinovataya city and one woman in the Kiev district of Donetsk have been wounded in shelling by Kiev forces,” officials from the Donetsk people’s Republic told the news agency. Following reports of shelling in Donetsk, Russian Foreign Minister Sergey Lavrov called on the current chairman of the OSCE, Ivica Dacic, to exercise his powers to influence Kiev into immediately stopping ceasefire violations. Moscow wants the SMM to “demand that Kiev immediately stops a flagrant violation of the Minsk agreements,” the ministry said on Facebook, adding that Dacic has promised to take appropriate measures. In the Kiev district of the city, artillery shells allegedly struck a school building, DNR reported. The entire neighborhood was reportedly covered in smoke coming out of a number of residential buildings. Also 20 residential buildings have been damaged in the shelling. The situation on the ground and the shelling has apparently been hampering rescue crew efforts to get to the scene to assist those stuck in the Kiev neighborhood, according Igor Martynov, who serves as mayor of Donetsk. The Donetsk militia did not return fire, claimed the DPR Ministry of Defense representative, Eduard Basurin. “We have nothing [to fire with]. Using machine guns against artillery is ridiculous,” he told Rossiya 24 channel. Although DPR, with the help of the joint Center for Control and Coordination managed to negotiate a ceasefire by midnight, some of the shelling continued into the early hours of Sunday, Basurin added. Basurin said that the OSCE has been notified of the violation and registered the shelling, with the Special Monitoring Mission (SMM) expected to visit the battle zone on Sunday to assess the scale of damage. In a series of diplomatic efforts, the Normandy Four group brokered a Minsk II peace deal in February. It involved heavy weapons withdrawal and the creation of a security buffer zone between the warring parties. However, despite the accord, fighting in eastern Ukraine continues, with both sides blaming one another for numerous ceasefire violations.